An ellipse has the property that any ray coming from one of its foci is reflected to the other focus. This is occasionally observed in elliptical rooms with hard walls, in which someone standing at one focus and whispering can be heard clearly by someone standing at the other focus, even though they're inaudible nearly everyplace else in the room. On this page, we'll show that this is true, by looking at several triangles in a magnified image of part of an ellipse. We'll also find an equation for an ellipse, and just for amusement we'll show that an "infinitely stretched" ellipse turns into a parabola. An ellipse has two foci. The sum of the distances from any point on the ellipse to the two foci is the same for every point on the ellipse. In figure 1, we show an ellipse in which the foci are 1.7 units apart, and in which the sum of the distances to the two foci is 2 for every point on the ellipse. 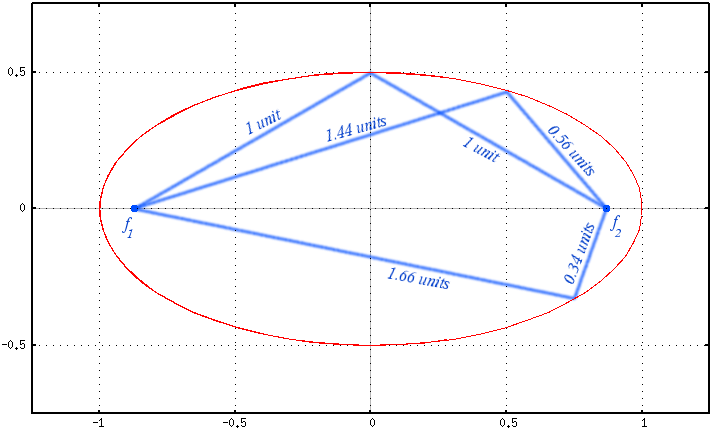 Just looking at figure 1, this assertion certainly seems plausible; for a ray following any of the blue lines, the angle of incidence and the angle of reflection where it hits the ellipse look equal. That's what we'll now show is true. Figure 2 shows a highly magnified view of two points on the ellipse, P1 and P2, which are extremely close together. They are assumed to be so close together, and the region in figure 2 is so small, that rays b1 and b2 which run to focus f2 are (nearly) parallel, and rays a1 and a2 which run to focus f1 are also (nearly) parallel. A careful examination of the picture demonstrates the proof; we shall now go over it in words. Rays a1 and b1 run from point P1 to the two foci, and rays a2 and b2 run from point P2 to the two foci. By definition of the ellipse, the sum of the lengths of rays a1 and b1 must equal the sum of rays a2 and b2. Ray b2 is ε units longer than ray b1; therefore, if a2+b2 is to equal a1+b1, it must be the case that ray a2 is ε units shorter than ray a1. And that is the key to the proof! Look at triangles ABC and EDC. For added clarity, these are shown highlighted in figure 3 and figure 4. They are each right triangles. Side D and side B are equal (each is ε units long), and side C is the hypotenuse of both triangles. We must, therefore, have the length of side A equal to the length of side E, as well; the triangles are mirror images of each other. Since the two triangles are identical (save that one is flipped), we must have angle α equal to angle β. Now, since b1 is parallel to b2, it must strike this tiny, nearly straight section of the ellipse at the same angle as b2, so we must also have angle α equal to angle γ. But then angle β must equal angle γ as well. 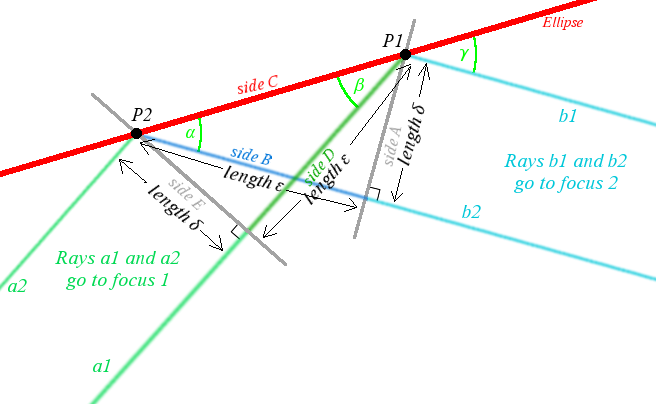 But then, a beam coming from focus 2 which strikes the ellipse at P1 will come in along ray b1; it will be reflected with an angle of reflection equal to the angle of incidence, which means it will have to be reflected along ray a1, which leads to focus 1. And that is what was to be shown. Rotate the ellipse so it's vertical, with focus f2 above, and focus f1 below (this just makes this argument a little easier to state). Send focus f2 up to infinity. Now, lines which come from f2 must all go straight down. So, all lines arriving parallel to the axis will be reflected to focus f1, and the figure must be a parabola, as we saw here on the parabola focus page. Q.E.D. Suppose we make the foci of an ellipse arbitrarily far apart. At the same time, suppose we keep the sum of the distances from points on the ellipse to the foci just slightly longer than the distance between the foci. If the distance between the foci is 2f, let's set the sum of the distances to the foci from any point on the ellipse to 2(f+h). And now, let's shift the ellipse so that one end of it just touches the origin, with its long axis extending to the right along the X axis. What will it look like? The "close" focus, f1, must be h units from the origin. Let's draw a line, parallel to the Y axis, h units from the origin, on the opposite side of the Y axis from f1. Call it the directrix. Now, the origin, which lies on the ellipse, is h units from the directrix, and h units from f1. As we move along the ellipse to points that are farther from f1, they must grow closer to f2, which we have assumed is arbitrarily far away. Because f2 is so far away, all lines to it will appear parallel. So, a point on the ellipse which is h+δ units from f1 must be δ units farther to the right -- or δ units from the Y axis, or h+δ units from the directrix. That means the figure is, by definition, a parabola. This visual argument could be shown more clearly with a picture but I haven't drawn one for it (as yet). I'll also show this symbolically, below. We've done everything so far just using the definition of an ellipse. Let's find an equation for one. Since we must have r > f, we see that the coefficient on x2 must be between zero and one, and the term on the right can be any positive value. Above we gave a visual argument (sans picture) to show a stretched ellipse turns into a parabola. Here we'll do it symbolically. which was to be shown (compare with the parabola equation we found previously).